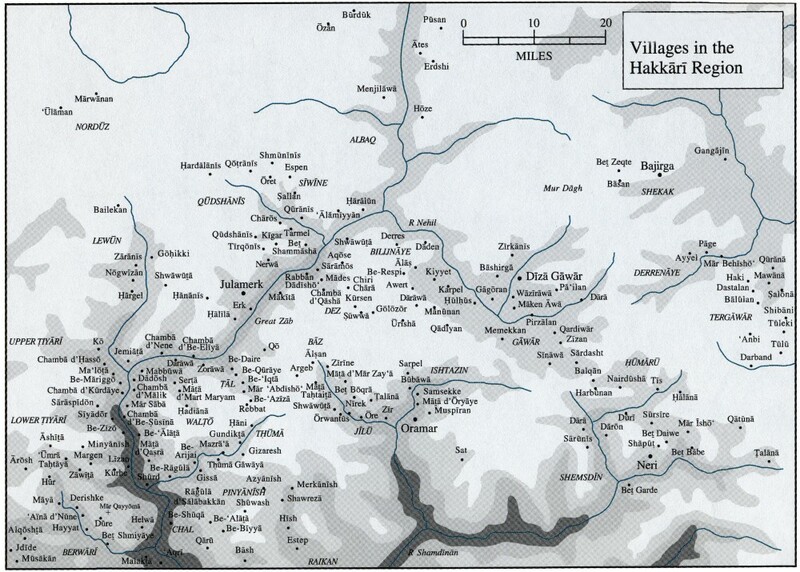 Karamles (Karamlesh) is one of the most ancient settlements in north of Iraq (Assyria). During the Sumerians Third Dynasty of Ur (third millennium B.C. ), Karamles (Karamllis) was called Kar-Denkir-Nin-lil, meaning the "City of the Goddess Nin-lil." According to Professors Parpola and Porter, Karamles is the historic Assyrian city of Kar-Mullissi, which meant in Akkadian the "City of Mullisi." The Akkadians used this name during their reign over northern Mesopotamia. Karamles, according to archaeologist Julius Oppert (Expedition Sceintifique en Mesopotamia, Paris, 1863), was called "Er-Elu-Banu," meaning the "City of the God Banu." Furthermore, a rectangular plate dated 734 B.C. with Assyrian Akkadian cuneiform inscriptions was discovered in 1957 by archaeologist Max Mallowan. The inscriptions reflected ownership of a certain sized land by a certain Kasudi in the city of Uru-Kar-Mesh (Karamlesh). Karamles is referred too as Garmsha in the "History of Rabban Bar 'Idta," as one of the four villages in the Mosul plain that had remained part of the Church of the East since the sixth century and the same name appears in a manuscript of Mardin according to Bishop Addai Scher. There is between 600 and 650 families in Karamles. The vast majority of the population is ethnically Assyrians (also known as Chaldeans and Suryan). They were mainly members of the Church of the East, however, they have converted to Catholicism from the late eighteenth and early nineteenth centuries and took the name Chaldeans. Today, the inhabitants of Karamles are mainly members of the Chaldean Catholic Church, but there are also members of the Syriac (Syrian) Orthodox and Catholic Churches. There is a very small minority of Moslems in Karamles, whose presence is relatively recent. 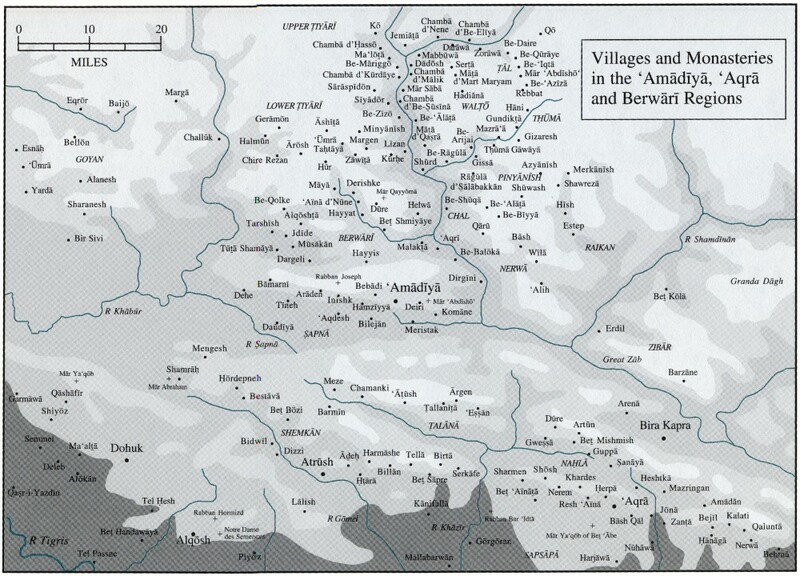 Originally, the town had eight main families but have since branched out to close to 50 families, including Alboshabi, Qatta, Hannona, Shinkul, Babikka, Tammu, Sha'yuta, Jiju, Deacon Estifu, Rammu, Makku, Tiyari, Zibari, Bi Banna, Eliya, Sa'aoor, Kanni, Eshu, Mamuka, Babu and others. Karamles (36° 19´ Lat. & 43° 28´ Lon.) sits on a large ancient hill that sits in the middle of a plain land. The town is some 15 to 30 feet above the level of the surrounding plain. Karamles is located less than 17 miles (28 kilometers) southeast of the ancient Assyrian capital city Nineveh (Mosul) and only 13 miles (22 kilometers) from the other Assyrian capital city of Kalhu (Nimrod). Karamles is surrounded by many historic tels or tells (hills), and these historic hills made one big city in the ancient times. The town is beautifully located near the Khazir (ancient Hozur) River to the east, Greater (Upper) Zab to the south and Tigris River to the west. A brook, named after the town, runs through Karamles and pours into the Tigris south of Nimrod. Joseph Bonomi (Nineveh and its Palaces, London, 1852) states that Karamles was a religious center and that it contained holy temples, something that is reflected from its name. According to Kubie, Layard had stated that the hills of Kalhu (Nimrod), Quyunjik (Nineveh), Dur-Sharrukin (Khursabad), and Karamles were the four corners of a parallelogram of 60 miles in circumference that represented the Greater Nineveh, which explains why it took Jonah three days to go around it. Archaeologists excavating in Assyria made sure to visit Karamles. The first who started those archeological diggings in the hills of Karamles was A. H. Layard and his expedition team, which included H. Ross, G. Rawlinson, H. Rassam and others, in 1846. Layard writes that the Assyrian artifacts that were discovered in Karamles prove that Karamles was a great Assyrian city. He adds: "At Karamles a platform of brickwork had been uncovered, and the Assyrian origin of the ruin proved by the cuneiform inscription on the bricks, which contained the name of Sargon, the Khorsabad king." Indeed, Karamles was as great as its contemporary Dur-Sharrukin (Khursabad). Karamles lost its importance during the reign of Shalmenessar III (858 – 824 B.C.) whose son led a rebellion against his father. This led to a civil war that lasted four years 827 – 824 B.C. The war caused destruction to many cities, including Karamles. For that it took the name of "Oru-Karmash," meaning "The Ruined City." Until this very day, Assyrians in neighboring regions call Karamles as Karmash. However, Karamles was reinvigorated during the reigns of Kings Shalmenessar V (726 – 722 B.C.) and Sargon II (721 – 705 B.C.). The great historical battle of 331 B.C. between the Greeks under Alexander the Great and the Persians under King Darius III took place at a site known as Gaugamela. Eyewitnesses and historians, such as Ptolemy and Strabo, attest to this. The victory of Alexander at Gaugamela had drastic political and social upheaval on the entire Near East history. The question is, where is the location of Gaugamela? Many scholars, such as Fuller, Oppert, Place, Grote, Stein, and Lane attest that Gaugamela is modern Karamles. Earlier, Darius I lost most of his camels and spoils from exhaustion around the city. Thus, the name Gaugamela (Aramaic Ko-Komle) came in use, which means the Camels' Square. The importance of Karamles seem to have declined after the death of Patriarch Dinkha II in 1381. 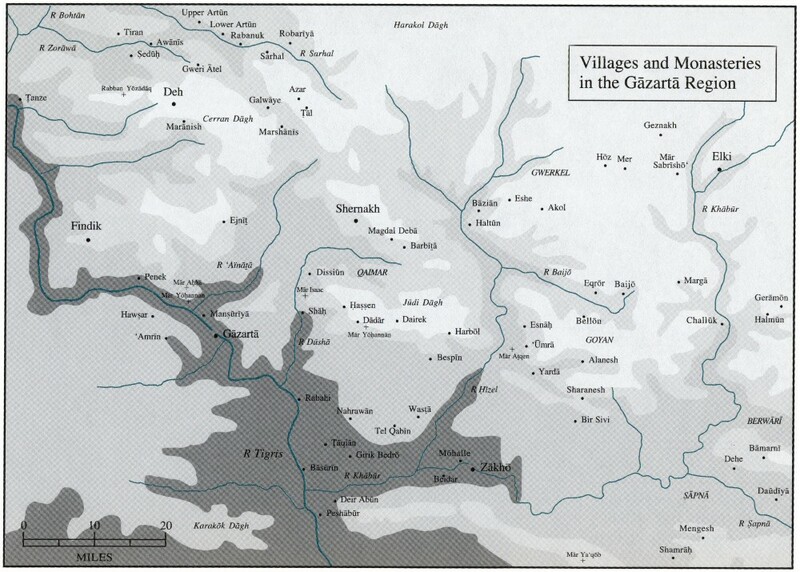 The village is mentioned again in 1567, when a scribe Hurmiz of Karamles copied a certain manuscript in the Jazira region. Many manuscripts have survived from the churches of Mar Giwargis and Mart Barbara between the seventeenth and eighteenth centuries. Excavations by archaeologist V. Place at the surrounding hills of Tell Barbara uncovered the remains of an Assyrian temple while at Tell Ghanam the remains of an Assyrian palace was discovered. V. Place dug between 1852 and 1854 in Karamles at the hills of Barbara and Ghanam. He writes that in Karamles there is a small hill not that high, however it occupies a large space. When digging there, we uncovered two layers of burned bricks that were equal in size and similar to those used in Dur-Sharrukin. The second layer contained cuneiform writings with the names of Shalmenessar and Sargon II. The information we gathered proves beyond any doubt that the remains under this small hill are ancient Assyrian remains. In the latter parts of 1934, a descendent of the originally Nestorian Christian al-Jalili family in Mosul that adopted Islam later, Sa'eed al-Haj Hussein Agha al-Jalili, began excavating at Tell Ghanam. He used the services of few Assyrians, such as Elias Hudi and Behnam Sha'ya. After months of excavation, the Iraqi Antiquity Department ordered them to stop digging and took them to court. At the time, many Assyrian statues and artifacts had been already discovered in two large and deep rooms. However, they were forced to return the earth back and cover their discoveries. On October 28, 1971, another Assyrian statue was discovered at the hill. Dr. Behnam Abu Al-Soof, the Director of the Iraqi Antiquity Department, coordinated with the Mosul Museum personnel who agreed of the discovery. On November 18, 1971, excavations at Tell Ghanam in Karamles unearthed an Assyrian doorstep decorated with the Assyrian rosette and a cylinder seal, believed to have belonged to King Sargon II. Lastly, but not least, it is a well known historical and archaeological fact that Nineveh had 15 gates. The fourth gate was designated for the city of Karamles (Kar-Mullissi). Karamles converted almost completely to Christianity by the second century of the Christian era. The process was long and not easy with the continued strong presence of Assyrian, Greek, and Zoroastrian religions. Most of the Assyrian temples were converted to Christian worship places. Early Christians faced great persecution and many became martyrs, including Barbara, the daughter of the pagan governor of Karamles. For that reason, one of the hills around the city is named after her. Karamles served as the see of the Church of the East for crucial period of persecution against the Assyrian Christians. In A.D. 1332, Mar Dinkha II (consecrated in Baghdad) decided to move the seat of the patriarchate of the Church of the East to Karamles after its relocation earlier from Baghdad to Arbil and then to Maraga. The see remained in Karamles for 94 years. Patriarchs Dinkha II (1332 – 1381), Elia IV (1381 – 1408), and then Shimun II (1418 – 1427), occupied the Karamles seat and the latter moved it to Alqosh in 1426. We know that the Christians of Karamles remained members of the Church of the East until Catholicism began to find its place in the Nineveh (Mosul) Plain in the latter parts of the eighteenth century. Still, and according to Wilmshurst, by early nineteenth century, the Diocese of Mosul of the Church of the East consisted of the city of Mosul and nine wholly Christian villages (TelKepe, TelIsqof, Alqosh, Piyoz, Karamles, Bet Qopa, Batnaya, Naseriya, and Bet Handawaya) to the north and east of the city. By the mid nineteenth century, many Church of the East (Nestorians) members converted to Catholicism. They became ever since known as Chaldeans. Mar Giwargis Monastery. This Monastery was built in the northern parts of town by a monk named Giwargis in late sixth century. It continues to stand to this very day; however, it is believed that it was turned to a cemetery after the Mongols invasion. Mar Yonan Monastery. A monk named Yonan built this monastery in the seventh century. The monastery is mentioned in an unidentified Nestorian writer in his manuscript in the fourteenth century. It is believed that it was abandoned after the invasion of Nadir Shah in 1743. Mar Youkhanna Monastery. There is nothing left of this monastery but a small hill known as the hill of monk Youkhanna (tell rabban Youkhanna) situated in the southern parts of town. It was mentioned in A.D. 660 in the manuscript of Bar'aeeta and it was populous in 1736 according to the manuscript of kitab dafanat al-Mowta (the book of the hidden treasures of the dead). It was destroyed completely during the invasion of Persian Nadir Shah in August 15, 1743. Dair Banat Maryam. It was attached to Mar Giwargis Monastery and served as a monastery for the nuns. The monastery suffered tremendously at the hands of Mongol in the thirteenth century and in the eighteenth century at the hands of Kurdish Ismail Pasha of Rawandos. It was referred to by Charles Watson Bradt during his visit to Karamles on June 2, 1758. The Church of the Forty Martyrs. The remains of this church are situated on a hill known as Beth Sahde (the Martyrs Home) southeast of the town. We know that it was standing in 1236, when Karamles was attacked by the Mongols. It was destroyed by Nadir Shah in 1743. St. Barbara Church. The church is situated on the ruins of a hill by the same name east of town. It was built on the ruins of an ancient Assyrian temple for the god Banu. Excavations at the hill in 1852 uncovered two halls used by ancient Assyrians in their religious ceremonies in addition to the findings of specific tools that were used during worship. The earth soil covers a Ziggurat that was built by ancient Assyrians to serve as a temple. Barbara was the daughter of the pagan governor of the region. She converted to Christianity, with her servant Yulina, against the will of her father who imprisoned her. When they refused to change their mind and denounce Christianity, the pagan governor ordered their death. They were killed in a room attached to the temple, where the church stand today. The church was attached by Nadir Shah, however, the town folks renovated and rebuilt it in 1798. The Church of the Virgin. The church is situated in the center of town. It is a small church but beautiful. It used to be the home of a lady who donated it to the public. It was established as a church in 1887 and enlarged in 1902. Mar Addai Church. The church is situated on the northern parts of town. It is the largest and most modern churches in Karamles at this moment. Construction began in 1937 and after some delays it was consecrated in 1963. Arbil was attacked and destroyed by the Mongols in 1235 and later the same fate followed Karamles. Bar Hebraeus, the Maphrian of the Syrian (Syriac) Orthodox Church, historian, philosopher, and theologian among other things, reported the attack of the Mongols on Karamles. Karamles is also commemorated in a poem of the Assyrian poet Giwargis Warda of Arbil, who described how the Mongols forced the Assyrian Christians of Karamles to leave the village. However, many returned and there are evidence of the presence of Mar Abdisho (Odisho), who was an active scribe in 1290, in Karamles. The continuous wars between the Persian and Ottoman Empires, prompted Persian Nadir Shah in 1732 to attack and occupy central and northern Mesopotamia, which was under the Ottoman rule. After occupying Baghdad in 1732, he deployed 8,000 of his troops to occupy Nineveh and its surroundings. However, his smaller army was defeated. In 1743, he headed an army of 300,000 soldiers and 390 canons and marched toward Mosul. He caused destruction in Kirkuk, Arbil and then in Mosul and the villages around it. He entered Karamles on August 15, 1743 and remained there for four days causing much killing and destruction. It is estimated that he killed over 4,000 people during those four days alone. He committed the same in Baghdeda (Qara Qosh) and Bartella (Baritle). Karamles (Karamlesh) is an ancient Assyrian settlement that flourished during the Neo-Assyrian Empire. Its Assyrian people adopted Christianity in the first and second centuries of the Christian era. The Diaspora community must work closely with the central and local officials and with the locals to protect this ancient Assyrian town and all the artifacts that are still buried under its mounds. It is the moral obligation of the Diaspora Assyrian (also known as Chaldean and Suryan) groups to initiate Karamles' economic revival. In a free, democratic, and pluralistic Iraq, we must take all measures and provide the locals with every incentive possible, including economical prosperity, to help them remain on their ancestral lands. Bar Hebraeus. Tareekh al-Zaman. Translated to Arabic by Fr. Ishaq Armalah. Beirut: Dar al-Mashriq, 1991. Kubie, Nora Benjamin. Road to Nineveh: The Adventures and Excavations of Sir Austen Henry Layard. New York: Doubleday & Company, Inc., 1964. Layard, Austen Henry. Nineveh and its Remains: A Narrative of an Expedition to Assyria during the Years 1845, 1846, & 1847. Originally published in 1882. Connecticut: The Lyons Press, 2001, p. 36. Parpola, Simo & Michael Porter. The Helsinki Atlas of the Near East in the Neo-Assyrian Period. Finland: The Casco Bay Assyriological Institute and the Neo-Assyrian Text Corpus Project, 2001.